A strong and durable tagger who built a reputation as an effective and unobtrusive defender, Kerrison etched his name into club history when he was a late inclusion for the 1990 Grand Final victory at the expense of Alan Richardson. Kerrison debuted in Leigh Matthews’ second game as senior coach against Footscray in 1986 and did not miss another game for the remainder of the year. He was a regular from 1987-1989, and hovered in and around Collingwood’s first choice team in the two years that followed. He was omitted after the disasterous loss to Hawthorn at Waverley Park late in the 1990 season but performed when it counted, winning 18 disposals and laying four tackles on Grand Final day. He replaced Richardson at the eleventh hour, after his teammate succumbed to a fractured collarbone. Incredibly, Kerrison went from outside the selected side and into the national spotlight when he had the first kick of the Grand Final. The ball cleared the centre square, flew over the head of Damian Monkhorst at full forward and bounced through for a behind, just seconds into the match. He battled injuries in the years that followed, but still managed to play 19 games in 1994. 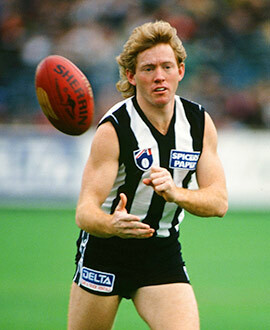 Opportunities were scarce in 1995, with the redhead chosen for just five games between rounds two and 21. He retired at season’s end and was honoured with Life Membership. Kerrison wasn’t lost to Collingwood, though, returned to the club as the team’s runner in the Grand Final year of 2002.